Anyway, this story takes place about a year after the “Hampton Uprising” that was just beginning as Sodom & Gomorrah concluded. In Kings of Babylon, an underground journalist fights to get stories in a world where bots and algorithms have rendered journalism — and indeed, truth — obsolete, and people care more about survival than they do just about anything else — including each other. At dusk, the tractor-trailer engines still thrummed. Their throaty diesel cadence made Annika think of a chorus of cigarette-smoking crickets, but the laugh she tried to summon at the image in her mind died before it reached her mouth. She watched the sky turn from pink to orange to red to a final, deepening blue. The August evening air sat warm and heavy on her skin, trapped her body heat in her cargo capris and baggy t-shirt so that she almost wished she’d worn something else. Almost, because she’d begun to attract the kind of attention she was supposed to write about: a wink here, a leer there among the steady flow of incoming and outgoing truckers. The idea gripped her heart that perhaps her source, the one who’d promised to show well before now, was a decoy to lure her. Annika fingered the mobile phone in her pocket. She was supposed to text Julie, the other reporter who’d dropped her off, if her source didn’t show. Julie wouldn’t text her to find out; it was Annika’s call, one she couldn’t yet bring herself to make. “I wouldn’t leave you alone after dusk,” Ray had promised. She’d believed him; why was she still so trusting, after everything the year had put her through? If so, perhaps she needed to find a new line of work. Then again, you needed some degree of trust in what other people told you, if you wanted to help them tell their stories. It would be just her luck for Gibb’s black Charger to again roar into the parking lot with its signature screech of rubber on pavement. She would watch it right up to the point it screeched to a stop inches in front of her legs, then stand here, still flabbergasted as she watched the window scroll down to see Gibb’s cheeky leer as he told her, “Come with me if you want to live.” A cruelty the universe hadn’t seen fit to hold back even in her mental state. She shook herself out of it. Now was definitely not the time to work through her old issues. If she didn’t stay vigilant, she would become the research she needed to do. She would give Ray five more minutes. Then she would text Julie and head home. A caravan of RVs pulled into the truck stop. They clustered around the gas pumps as if their drivers planned to gas and go, as quick a getaway as they could make. That came as a surprise; the truck stops saved costs by asking travelers to contribute, because neither old or new employers offered any kind of travel stipend. The people on the road obtained gas and goods based on the time they contributed stocking shelves or washing laundry. Then again, perhaps these RV’ers had reserved enough cash to pay that way. Annika had heard that sometimes that was possible. The doors opened and family members began to disembark. Fathers shook out their legs. Mothers helped toddlers down from doorways. Teens played cool, took their time, held themselves only a little apart from the rest. Annika counted three all-white families, one mixed-race, a black mother with a white husband. They walked as a group toward the store, a school of minnows moving as one to avoid the circling sharks and barracudas. Again Annika shook herself. Why read into the situation on the defensive? All she had to work with was a rumor of kidnapping, nothing more. She’d interviewed dozens of these people over the past six months — engineers and marketers and human resources staff between corporate jobs, heading to or from Boston or New York — and not one of them had said anything to her about fearing for their wives or children or sisters or daughters. None even hinted that truckers might kidnap and sell their loved ones. If she was honest with herself, the only reason she didn’t want to believe the rumors about the truckers was that she’d first heard it from Gibb. Annika followed the RV’ers into the store. She and Ray had agreed to meet in the front, but if he was late then she hoped he’d know to look for her. If he was a no-show then she had Julie, and in the meantime she had research to do. The truck stops looked no different than they had back in the day: fuel pumps, diner-style restaurant, convenience store, amenities: laundry and showers. The RV’ers had split into pairs so that they could browse the aisles of snack food, clothing, automotive supplies, entertainment. Annika strolled a path perpendicular to them, noting how defensive these families remained with their tight body language, the way one or two smaller or weaker-looking members stuck close to larger, stronger members. Yet well-organized kidnappers could easily overwhelm small groups like this. One or two could distract or attack the strong, and one or two could drag away their target. Assuming they did it that way. Assuming it even happened at all. Of course it happened. The kind of world they lived in, why wouldn’t it? It had been three years since her mother had rocked her world, had told her that the community they knew, the truckers with recognizable handles and voices and knowledge, who would look out for the long-haul driver and her daughter, could no longer be counted upon. Fear and debt had made most of the other drivers put their corporate masters ahead of humanity. “That empathy ban is doing exactly what I said it would,” Candy fretted. “Truckers are people like everyone else. Afraid of losing their jobs. Being —” Candy shut up fast. Annika couldn’t get her to say what losing their jobs meant. Maybe that needed to be her starting point as she worked to get the facts: what truckers could fear so much to do the unthinkable. If she could get past her own fear of talking to them. Two of the clusters of RV’ers, one group of four teen girls and the other group of three mothers with five toddlers, made their way towards the bathrooms. Still grouped tightly, defensively together. She followed them. Before she could enter she sensed a presence; her elbow tingled. She spun around, too late to mask the spike of anxiety and fear that made her vulnerable to anyone who didn’t take empathy inhibitors. She thought she recognized one of the men from the RV caravan. He seemed to tower over her, glared into her eyes. For a corporate lackey he sure had street sense. “Help you with something?” he growled, low and gravelly. “That’s the worst cover story I’ve ever heard. Lady, there are no reporters anymore. Just bots and public relations firms. No one’s trusted the news in years, or have you been living under a rock? Never mind. Where’s your partner?” He scanned over her head, over the tops of the aisles. “Partner?” It dawned on Annika that he thought she might be part of a kidnapping gang, scouting victims, targeting marks. “I don’t — I’m not —” Then she shut up, fast, because admitting her aloneness made her vulnerable. What happens next? 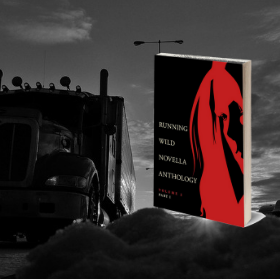 The Kings of Babylon is available now in the Running Wild Novella Anthology Vol. 2 Pt. 1. (Check out another sneak peek on that product page!) If you missed the first novella, Sodom and Gomorrah on a Saturday Night, you can pick up a copy of the first anthology here!